The moment that you first lose sight of land and are alone with your boat, surrounded by nothing but sea and sky, is a powerful experience for any sailor and one that cannot be truly described until it is experienced. As anyone who has reached that moment will tell you, it is not something to be undertaken lightly, even if you are only traveling port to port. Any sailing excursion requires planning and attention to safety, but ocean sailing requires a great deal more thought and preparation. You have to take what you need from land with you, plan for the unexpected, and be prepared for all sorts of setbacks. This is not meant to discourage you! Ocean sailing is exciting and absolutely worthwhile, but you must be prepared. 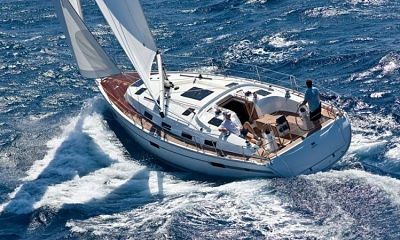 The guide below covers some of the basic needs for ocean sailing and how to go about it. So read on and get ready. As you will be on the water for a much longer time, you should expect to encounter both good and bad weather — and it is the bad weather you have to be prepared for. Heavy air is the more frightening prospect, but light air can be just as frustrating and knock you off your planned schedule. When you encounter times of very light breezes, you will most likely want to turn on your engines. Do not, however, take down your sails — even a light breeze in the sails can increase the efficiency of your engine and help you use less fuel. Have safety harnesses on board — not just lifejackets — that you can clip to a jackline (a line that runs from bow to stern without interference) to prevent you or your crew from being knocked or blown overboard. Make sure there are no loose items, as your boat will be tossed around on the waves and you do not want expensive gear crashing around down below. Learn how to reef the main and do so when the wind picks up. One very helpful tip for dealing with heavy seas is this: DO NOT head directly into waves, and do not let them hit you directly on the side. Pointing your boat into waves at a 45-degree angle will minimize the abuse that your boat will take. Plotting a course and sticking to it is essential for any serious amount of time spent at sea. Underwater formations, shipping lanes, and powerful currents are all factors that you must take into account when deciding on your route from port to port. This is where knowing how to read and use a nautical chart will come in handy. Study the charts that cover the area you plan to traverse, watching out for all the obstacles mentioned above. Chart your course using buoys and latitude/longitude points. You can and should program your course into a GPS, but you should also keep your charts with you as an additional point to check your course against. In addition, if you plan to spend a lot of time sailing offshore, consider having a radar device on your boat — its measurements of your actual location are more accurate than those of a GPS. This is particularly important if you are traveling to a location that you have never been to before. You can never be too careful when approaching an unfamiliar coastline. It is this part that can be more dangerous than crossing an open ocean, and will require the most amount of care and attention to detail. You know that these three things — food, water, and fuel — are essential to any long-term boat trip; it is a no-brainer. But when you are planning a long trip, even if the ports you will be stopping at have grocery stores, you should be careful when preparing your provisions. When packing up on food, you want to stock non-perishables that will provide you and your crew with the basic levels of nutrition that you need and will save you from having to make time-consuming and often expensive grocery runs. Foods like oatmeal, pasta, tinned fruits and vegetables, and even peanut butter, will give you energy and nutrition and can also be bought in bulk. When it comes to water, you want to have your water tanks full, and supplement them with water bottles for you and your crew. In addition, you should consider a filtration system that will allow you to purify and drink ocean water as a back-up or simply as an additional source of H2O. It can be useful to think of fuel in the same way. You of course want to have your fuel tanks filled, and to store extra fuel in watertight containers in case you use more than you think you need. Take into consideration when and where you will refuel — know the marinas and fuel docks ahead of time. In addition, you should know how much fuel your boat uses at cruising speed, and calculate the amount you need or how often you will need to refuel accordingly. For all of these essentials, the key is to have as much as you think you need — and then have more. Even if you know your course and know where you can pick up more supplies, it is best to pack yourself some buffer room. Take more than what you need. Plan for bad weather of all sorts. If you are well prepared and ready for losing sight of all human dwellings, your trip will be a memorable, wonderful experience.